Longtime Mac users—at least those on the platform since Mac OS 8.5—will remember the “classic” application menu. 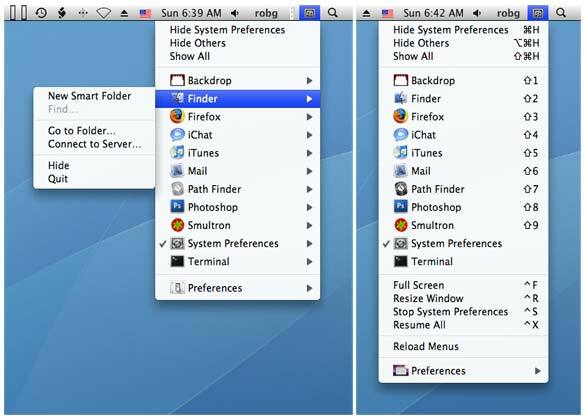 Unlike OS X’s Dock or its keyboard-based application switcher (a horizontal panel of application icons), the switcher pre-OS X was a vertical menu anchored to the right-hand edge of the menu bar. This made it a snap to use with the mouse; just fling the cursor to that corner of the screen, click, and the menu of running programs would appear, letting you quickly switch to any one of them. For those who miss the OS 8/9 approach, two programs aim to fill the void. They’re very similar, because at one time, they were actually the same program. First on the scene, years ago, was ASM . ASM was originally free and open source, but after version 2.0.2, it became a $16 shareware application. The second was the free (and open source) multiXFinder . Not surprisingly, the programs look alike and work in a similar manner. Each installs as a System Preference pane, and each adds an application-switching menu immediately to the left of the Spotlight icon in the menu bar. Click the icon, and you’ll see a list of running applications as well as a few additional entries; choose any program in the list to switch to it. In addition to switching apps, both programs let you hide other apps when switching (sometimes referred to as single-application mode), and you can exclude specific programs (iChat, for instance) from being hidden in single-application mode. Other common features include the ability to control the appearance of the menu-bar icon and title; to choose whether to show application icons, names, or both in the menu; to dim icons of hidden applications; to specify a fixed or variable menu width and alignment; and to choose which additional options appear in the menu. So what distinguishes the two programs, given how much feature overlap they have? The biggest functional difference between the two is that ASM includes—when using the program in OS X 10.5—the useful ability to display each program’s Dock menu as a submenu in the ASM menu. Given that the ASM menu includes only running applications, this approach is easier than locating a running application’s Dock icon, especially if you keep many nonrunning applications in the Dock. ASM (left) and multiXFinder (right) both bring back the pre-OS X application switcher. ASM even shows each program's contextual Dock menus. MultiXFinder lacks ASM’s useful Dock submenus but adds a few features of its own. The most notable is the ability to disable the Spotlight icon on a per-user basis. This means that if you really miss having the program-switching menu anchored to the right-hand edge of the menu bar, you can put it back there (at the expense of the Spotlight menu, of course). However, in my testing this feature was a bit unreliable. Sometimes toggling the Spotlight icon off wouldn’t turn it off; I’d have to toggle the setting a second time. And even if you successfully disable the Spotlight icon, opening the Spotlight pane of System Preferences restores it. MultiXFinder’s menu will also display background processes if you hold Shift and Control while activating the menu—but since you can’t switch to a background process, this feature is more informational than practical. And by enabling an Advanced Features option, you get new menu commands that let you expand the active application’s frontmost window to fill the screen and (more interestingly) stop or start the application. The latter feature is different from quitting and relaunching; it uses Unix features to actually “pause” the current program, literally freezing it so it doesn’t use any processor cycles or respond to any input. Once you “restart” the program, it will act normal again. If you have a CPU-hungry application that you’d like to keep running but not actively use CPU cycles, stopping it is a good solution (and one that’s supported by the OS, so this isn’t a hack). Finally, multiXFinder can assign shortcuts to the first nine entries in the menu, letting you switch to one of those apps using the keyboard. Unfortunately, this feature is largely useless, as the menu must be visible for the shortcuts to work—and if the menu is visible, that likely means you already have your hand on your input device and the cursor is already on the menu. So which should you use? Both worked well in my testing, but I preferred ASM due to its inclusion of each application’s Dock menu. If you don’t need this feature, multiXFinder works just as well and won’t cost you a penny.